Shoulders must turn more than the hips to achieve coil. Golfers can achieve greater power and speed in their swing by creating coil in the backswing. Professional golfers turn their shoulders back twice as much as their hips during the backswing. This separation between the shoulder and hip turn creates coil, which helps produce speed in the downswing. Many amateur golfers struggle to create this coil because of a poor setup and a misunderstanding of proper body turn. With a good setup and a better understanding of the proper body turn, you can achieve maximum coil and power in your swing. Set up to the ball with a shoulder-width stance and a slight flex in your knees. Align your feet parallel to your target line with your left foot turned out slightly toward the target and the right foot perpendicular to the target line. Positioning the feet properly will help you restrict your hip turn on the backswing. Distribute the weight equally on the left foot and right foot. 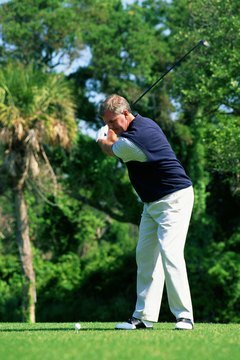 Start the club back with your shoulders while keeping your belt buckle facing the ball as long as you can. This will help you restrict the hip turn. Halfway back in the backswing you should have rotated your shoulders twice as much as the hips. Maintain your knee flex as you continue to swing the club back. Shift the majority of your weight to the inside of the right foot as you turn back. Keep turning your shoulders until your left shoulder is under your chin. Restrict your hip turn as you complete the backswing for maximum coil. Stop your backswing when your left shoulder is under your chin. Your knees should be flexed and the majority of your weight on the inside of your right foot. Your hips should be turned back half the amount of your shoulders. You should feel some tension at the core of your body. Golf Digest:Fitness Friday: Is This X-Factor Good For You?